Free download Mario game for Mobile phone. 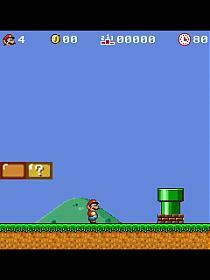 Mario is very popular game from the 80s and played a lot of on computer as well as on some televisions. As the mobile technology has been improved and increased so the Mario Game for Mobile also has been developed. Mario Game for Mobile can be played on every mobile phone because it is Java application with .jar extension. And you know well that almost every mobile support Java (Except Nokia 1100, 3310 or any black and while simple mobile). So you can play Mario Game for Mobile easily by simply downloading it into your phone. The installation process is very simple and easy. All mobile those support only java application will play Mario Game for Mobile directly without installation while if you have any mobile with operating system such as Symbian, Android, BlackBerry or iOS then it will take very little time to install by following some simple steps. The Game Name will show as NamLunDiDong when you complete the installation. But do not worry the Mario Game for Mobile is within. Open this and first of all choose English. Then go upward and select New Game. Now you will see the screen with score etc, just skip this and select Next button. Now you are ready to play Mario Game for Mobile.